[SatNews] The market is currently dominated by narrowband L-band systems.... Ku-band and HTS gained inroads in the Transportation and Cargo markets and Green Energy and Construction. Released tomorrow NSR's SCADA/M2M via Satellite, 4th Edition finds a steady market for narrowband systems despite the industry’s seeming shift into higher bandwidth solutions, specifically High Throughput Satellites (HTS). In 2012, revenues stood at $1.1 billion with narrowband systems accounting for 87 percent of the global total. By 2022, the market is expected to reach $2.0 billion with narrowband systems improving slightly, accounting for 88 percent of the revenue base. While key verticals including the Military, Transportation and Cargo drive the market; the Energy-related verticals such as Oil & Gas, Utilities and the Mining play a strong role in the steady narrowband growth due to their dependency on narrowband solutions to run mission-critical applications. Given high demand for narrowband applications, NSR does not foresee a game change in the solution mix for SCADA/M2M over the long term. “Higher bandwidth Ku-band and HTS systems will have specialized roles to play in the marketplace such as remote video surveillance, but the overarching solution will likely continue to predominantly be narrowband systems,” according to the study’s author Jose Del Rosario, Senior Analyst for NSR. In its 4th Edition, NSR’s annual report continues industry-leading tracking and analysis of the SCADA/M2M via Satellite market. The report provides a complete and comprehensive analysis of addressable markets and demand trends for the SCADA/M2M market today, covering eight regions and 10 distinct vertical markets. The report forecasts in-service units and service revenues in each frequency platform that includes L-band, Ku-band, C-band and HTS for the period 2012-2022. NSR is a leading international market research and consulting firm with a core focus on the satellite sector and related industries. 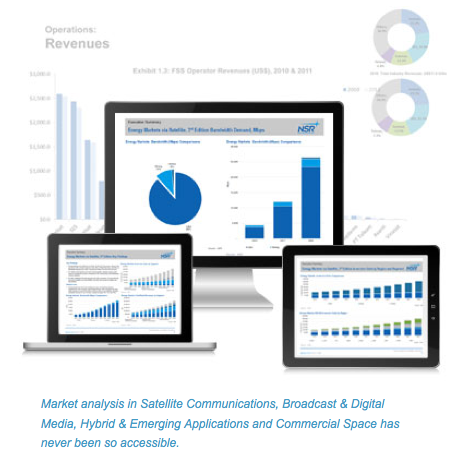 Founded in 2000 and with an experienced group of analysts located in all regions, NSR specializes in analysis of growth opportunities across four core sectors: Satellite Communications, Broadcasting & Digital Media, Hybrid & Emerging Applications and Commercial Space. NSR delivers clarity with critical market insight providing market leaders the edge over the competition. NSR announces newly reformatted reports to better assist their clients’ needs. NSR's new reports deliver trusted NSR analysis in a clearer, concise package. The new format complements NSR's legacy of detailed analysis, merging a clean modern presentation with generations of knowledge.